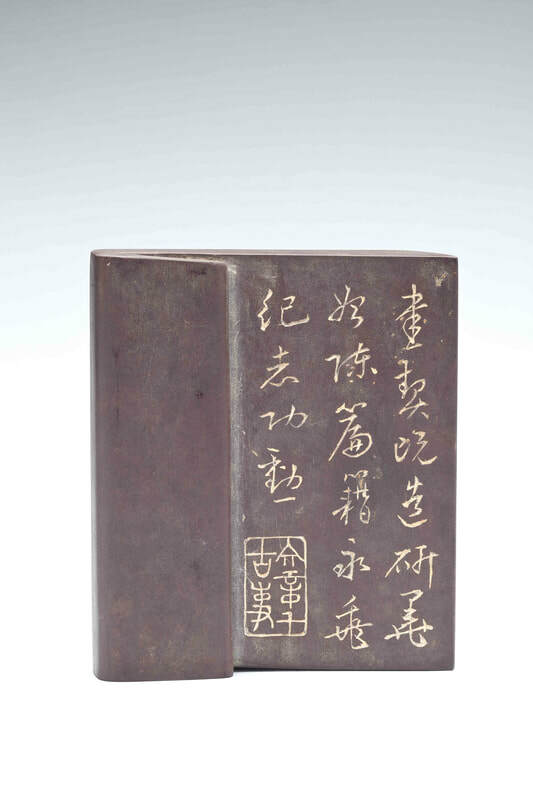 ​A duan inkstone in the shape of a folded book inscribed清入詩觴健有神and on the reverse書契既造硯墨乃陳篇籍永垂紀志功勳and with seal文章千古事. 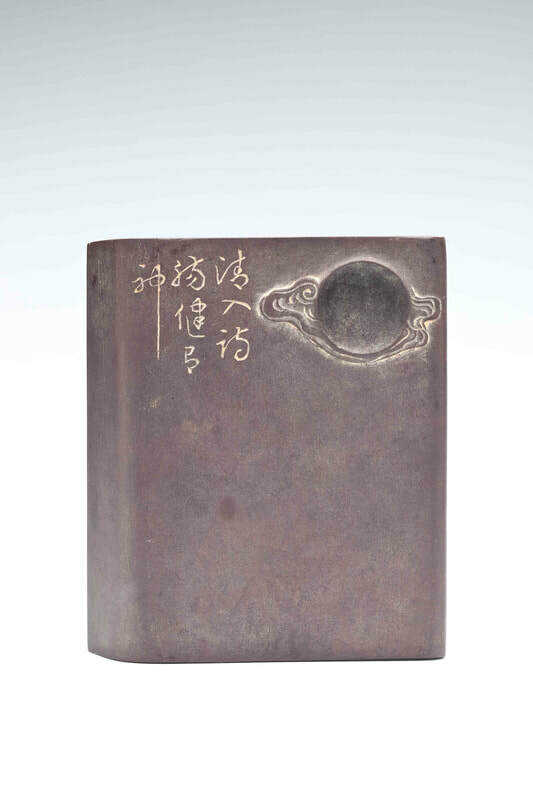 Qing dynasty, 17th–18th century. New zitan box and cover. 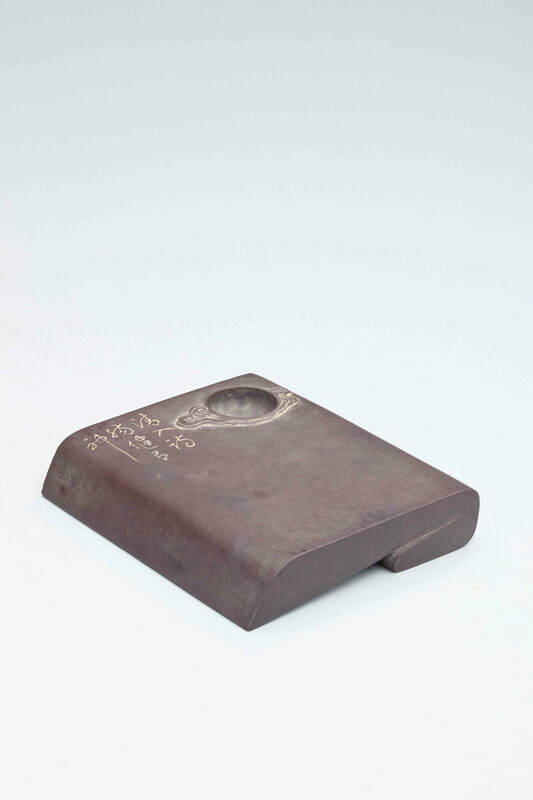 An inkstone of duanstone in the shape of a folded book with a slightly concave ink-grinding surface and a circular ink pool carved with surrounding clouds and incised with running-script calligraphy to the left, reading 清入詩觴健有神, ‘When clarity enters the wine vessel of poetry, it makes one healthy and spirited’,the reverse also inscribed in running-script 書契既造硯墨乃陳篇籍永垂紀志功勳, read as ‘writings have been created, ink was brought in to record them in detail, the page would exist forever and merits would be remembered’, and a five-character seal文章千古事, read as ‘Excellent articles will be read for thousands of years’. New zitan box and cover. Nicholas Grindley, London, 1998 (0998-43). Ian and Susan Wilson, San Francisco, C85.